EUR/USD - 1.1396.. Although euro continued its recent losing streak last week n hit a 2-1/2 month trough of 1.1303 (Wed), failure to re-test 2018 low at 1.1301 n brief broad-based usd's pullback lifted price to 1.1456 Fri.
On the bigger picture, despite euro's resumption of LT uptrend fm 2017 near 14-year bottom of 1.0341 to marginally higher abv Jan's 3-year peak of 1.25 38 to 1.2555 in mid-Feb, subsequent selloff to 1.1301 in Aug confirms said major rise has made a top there. 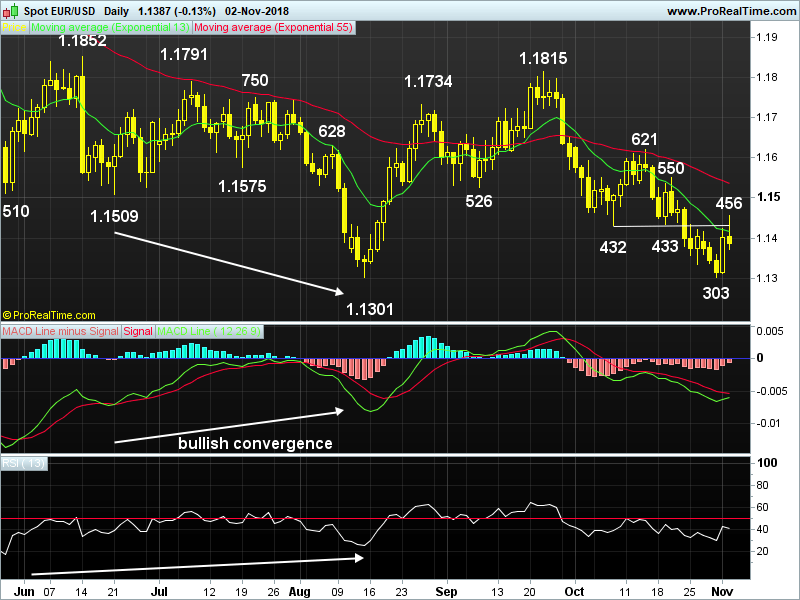 Although euro's rally to a 3-1/2 month high of 1.1815 in Sep suggests temp. low has been made, subsequent decline to as low as 1.1303 last week signals correction fm 1.1301 has ended n would yield re-test of this level, 'bullish convergences' on daily indicators should keep price abv 1.1187. On the upside, only abv 1.1550 would prolong choppy trading abv 1.1301, then risk would shift to the upside for stronger retacement to 1.1621, 1.1734. Today, euro's rally to 1.1456 in Europe Fri but failure to close abv key 1.1432 res n subsequent retreat to 1.1373 suggests at least 1st leg of correction is over n choppy sideways swings are in store, as long as 1.1336 holds, another rise is seen, abv 1.1466, 1.1490/94. Below 1.1336 may risk weakness twd 1.1303.